Wilf’s story, we might already guess, is not to be taken too literally – this is no social tract for our troubled times. He’s not some latter day Artful Dodger needing to make a shilling or two, he’s the son of a widower banker, living in a luxury flat in Canary Wharf – which is where, after a frenetic pursuit on foot, by bike, and then taxi, he finds refuge from the suits. Wilf christens his pursuers Badger and Snout, and there’s something very odd about them. They can dematerialise at will, summon up a silver Mercedes which, on security cameras, appears to be driverless; and what’s more, Badger and Snout know where he’s heading before he does. Back in the apartment, there’s an even bigger surprise. In the corner of his bedroom squats a creature. 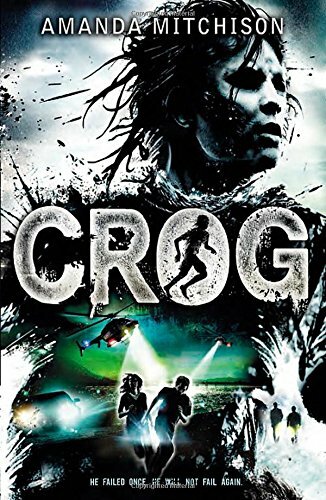 It squelches, coughs, and says it’s called ‘Crog’. It might pass for a muddy, bedraggled boy with a soggy rope around his neck, but Crog claims he’s been sleeping for 3,000 years and repeatedly mutters: ‘I failed afore. I must not fail again.’ Before long, Wilf’s more conventional twin sister Ishbel shows up. Like Wilf, she accepts Crog without too many plot-delaying questions, though she does insist he has ‘a nice hot bath and something to eat’. Crog wants that bowl; back in time, the survival of his race depends upon his returning with it, he says. Badger and Snout want it too – we don’t know why. But Wilf reckons it’s his – after all, nickers keepers. It’s not long before the suits are racing up the apartment stairways having, it seems, murdered a security guard en route. The three escape down the laundry chute and the chase is on, and indeed it continues for most of the rest of the book. The lengthy pursuit cannot quite sustain the tension of the opening pages, for despite their mysterious powers, Badger and Snout never make direct contact with the trio as they journey to Scotland where, Crog tells the twins, all can be resolved through the power of the bowl. The hunters’ failure means our interest must focus on the evasions and interactions of the hunted. There’s a strong vein of humour in Crog’s adjustment to our world. He loves flush toilets, for example, and he’s regularly astonished by our eating habits; while his rapid acquisition of contemporary language is both comic and endearing. There is a fine creepy episode in which Wilf finds himself the only living being in a church service crowded with a congregation of the dead, including his Mum; and a final revelation which wrongfoots the twins as surely as it did this reader.